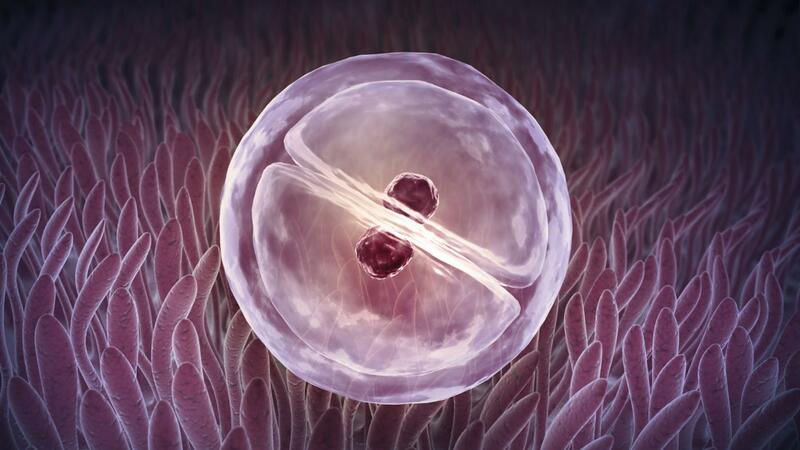 Mitosis is the process via which cells divide, producing copies of themselves. Cancer is essentially mitosis that is out of control. Cancer cells do not operate in the same way as other cells in the system they occupy, so they replicate and damage surrounding tissues. When cells divide, the result is generally two identical copies of the original cell. A "parent" cell distributes its genetic material into two "daughter" cells during replication, which then take on the characteristics of the parent cell. Usually, this process works seamlessly; however, when Cell Cycle genes mutate within cells, mitosis goes from a controlled process to an uninhibited, reactive event. Unlike normal cells, which respond to density-dependent inhibition, tumor cells continue to divide, and multiply at an increased rate until all available nutrient supplies are depleted. When tumor cells are benign, they remain at the original site. When they are malignant, however, the tumor quickly becomes invasive: at this point, the mass is known as cancer. Sometimes, cancerous tumors contain cells capable of triggering the formation of blood vessels specifically designed to create a nutrient supply for the mass. Malignant cells then gain a pathway via which they can travel to other parts of the body. When this occurs, the tumor has metastasised.